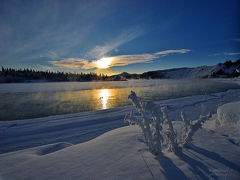 Winter season is a very special period at Tagish Lake. Although daylight is short, there are a lot of ways to spend your vacation at Tagish Wilderness Lodge – be active and hike through the winter forests, pamper yourself in our wood-heated whirlpool or simply relax and take a deep breath of fresh, clean air. Yukon's Winter Wonderland awaits you – experience the crystal clear winter days, deeply frozen lakes and take part in a choice of typical Yukon activities like dogsledding, snowmobiling, snowshoeing or even watching the mystic Northern Lights (Aurora Borealis). Your adventurous day ends with a hearty, home-cooked dinner, lovingly prepared by your Swiss hosts. In your cozy log cabin, you will gather new energy for the next exciting day. Pick up in your Whitehorse hotel in the morning and transfer to Tagish, approx. 1 hour driving time. In Tagish, you will change your mean of transport and cross the frozen Tagish Lake either by dogsled or snowmobile for another 50 minutes to 1 hour. Time to relax and get settled for the following days at your wilderness getaway. In the morning, you will be introduced to the basic technique of mushing, by a professional mushing guide. You will also learn how to harness your dogteam and how to take care of them after an active day. After the introduction, you will go on a tour with your own dogsled, enjoying the ride through the forest and over the beautiful Tagish Lake. In the evening, you may want to relax in our wood-heated sauna or jacuzzi. 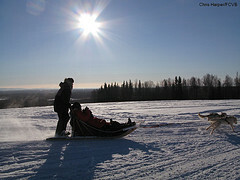 The Skidoos are many Yukoner's mean of Transport number 1 during winter time. Today's trip brings you to the top of a nearby mountain, from where you can enjoy a breathtaking view over the Southern Lakes Region, the headwaters of the mighty Yukon River. On the way, you will enjoy an outdoor meal around a campfire, like the first trappers and prospectors did more than 100 years ago. Today, you may want to relax and enjoy the surroundings of the deeply frozen Tagish Lake, or take part in another soft activity, such as the popular ice fishing, an easy winter hike on your self-made snowshoes or an active tour on crosscountry skis. 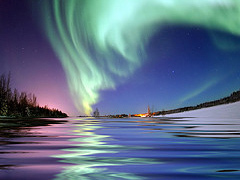 At night, if luck is on your side, you may be able to marvel at the mystic Northern Lights, Aurora Borealis. Sitting around a sparkling campfire and protected by a trapper tent, you wait for these fascinating nature phenomenon – at ideal conditions, the Northern Lights span over the whole lake towards the north. You will be transferred back to Tagish by dogsled or snowmobile and further on to Whitehorse by car. Individual departure from Whitehorse or continuation of your program. X-Country Ski, Ice Fishing, Snowshoe Hiking etc..